Hi, and welcome to another issue of Learn Hot English – the fun magazine for learning English. 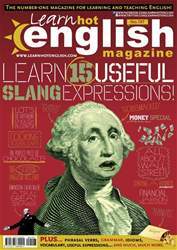 In this month’s issue, we’ll be teaching you 15 really useful slang expressions. They’ll help you understand native English conversations, as well as films, TV series and songs. Of course, that’s not all, and we’ll also be looking at chocolate, airbrushing, Winston Churchill, Wall Street, Shia LaBeouf, ambush marketing, trends and graphs, buildings of the future, and lots, lots more! Well, we hope you enjoy reading and listening to this issue of Learn Hot English. Have fun, learn lots of English and see you all next month! Great news! The latest issue of Hot English (197) is out now! Learn over 1,000 useful words and expressions and improve your listening skills with Learn Hot English! 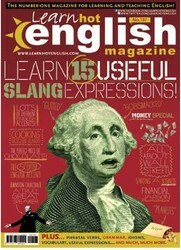 This month: Learn 15 useful slang expressions so you can understand native speakers, songs, films and TV series better. Plus, 10 useful words and expressions for talking about chocolate and cooking, 12 useful words and expressions for describing graphs and charts, idioms, phrasal verbs... plus: • Food – chocolate. • Grammar – relative clauses (who, that). • Typical errors – error correction. • Art – airbrushing. • History – JFK versus Lincoln. • Language – how to learn idioms. • Politics – Winston Churchill. • Finance – Wall Street. • Cinema – Shia LaBeouf. • Business – how to start a business. • Marketing – ambush marketing. • Accents – the Scottish accent. • Architecture – buildings of the future. • Words – oxymorons. AND LOTS, LOTS MORE! By reading and listening to all this great content, you'll improve your English reading and listening skills and learn up to 1,000 useful words or expressions. Plus, you'll get a better job and pass English-language exams more easily. Guaranteed!